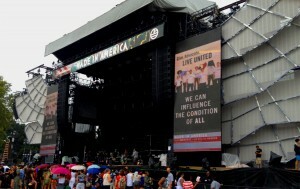 Recently one of our nonprofits had the opportunity to display their videos at a concert of 75,000 people. Now I realize that you may not have the opportunity to do large scale concerts, but what you do have the opportunity to do is affect the branding of your video. Some organizations are supplied with national/worldwide videos that may be of excellent quality, but they lack the local feeling that will really promote giving. So, let’s look at some fixes that can help your videos, whether they are shown to a potential donor at their home, or shown to thousands at a gala. Are you looking at images of a mid-west town when you are located in a bustling urban area? Are the people seen in the video representative of the diversity in your area? You know how exciting it is when you recognize your surroundings in the news, so you can only imagine how important location is to your viewer. If it’s not fitting your criteria, then it’s time to shoot some images of your area and do an edit. You may find your local tourism office has some “beauty shots” of your area to choose from, both in video and photos. Of course gritty images may be of more help to your cause, so don’t be scared to go after what you really need to tell the story in an honest way. Do you have someone in your organization or a local celeb that is comfortable talking directly to the camera/audience? Then it’s time to involve them! Either at the open or close of the video, it can be helpful to add their call to action for your cause. It’s vital that this be kept short, because if it sounds like a speech, it will never work — think three sentences in a very conversational tone. 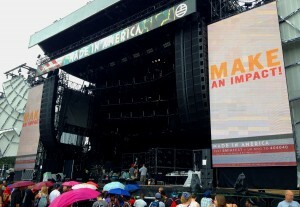 You may have to use a teleprompter or go “off the cuff” to get this to work, however, this can be a great way to engage your audience. Although this is not my favorite choice, it can still be helpful, especially if the video you have been given is filled with voice-over and images. Take time to come up with some very brief stats that spell out the problem in your area and either overlay them over the existing imagery or insert your own graphic frames with text in between. This way you will be able to make your problem relevant to your audience. This may seem obvious, but your organization may be large enough to have different chapters, yet the contact information does not reflect this properly. Make sure you add your own website, phone number, social media connections or even mobile “text to” info at the end of your video. Not only are you making it clear that you are representing locally, but you are also allowing information to be trackable for click-throughs and donations. You love the video you’ve been given, but you suddenly realize that the person being interviewed has an accent that is obviously not from your area. No matter how similar this person is in their situation, there is no way to sell it to your audience. In fact, it would be better to just eliminate it. If it is the only interview in the piece, then it would be best to get your own interview to add in. Even a less than perfect local interview trumps a beautifully shot non-local interview any day of the week. So, go be a talent scout! Although these fixes are aimed at national videos, the same tactics can be used to renew old videos. Take a look at what you have and see if the message is still similar and if the stories are still true today. You might have more than you think!